Private collection, United States, by whom acquired directly from the artist. Acquired from the above by the present owner before 1989. This work is sold with a photo-certificate from Robert Descharnes. Le voyage fantastic is an hallucinatory portrait made at the height of Dalí's so-called 'pop' period in New York in 1965. The painting was made as part of the promotion of the 1966 film 'Fantastic Voyage' starring Stephen Boyd, Donald Pleasence and Raquel Welch. Early in 1965 Dalí had been asked by Twentieth Century Fox to be in charge of the artistic part of this groundbreaking science fiction film. Dalí's first response to this challenge was to paint this work which incorporates many of the elements of the film with several of his most recent painterly techniques. Foremost among these is the computer-based printing technique of building an image with dots that Dalí had recently transformed into a new optical style in such works as Portrait of my Dead Brother of 1963. 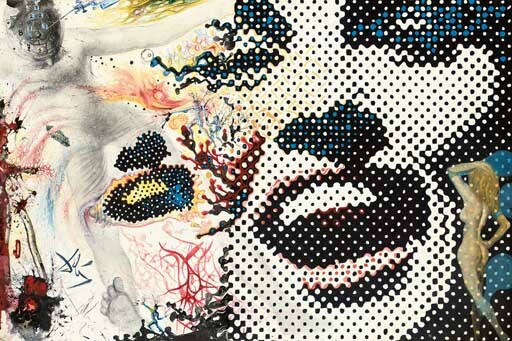 Like several contemporary Pop artists such as Roy Lichtenstein or Sigmar Polke for example, Dalí had begun to experiment with raster dots as a way of rendering images. Painting them illusionistically as spheres, Dalí transformed these raster dots into molecule-like particles that echoed those of his 'Nuclear mystical' painting of the 1950s. In Fantastic Voyage these dots are rendered as a flat field in an op-art way that combines to form a partially recognisable image of Raquel Welch. This image is shown dissolving into particles in a way that echoes the plot of the film in which a crew of scientists were reduced to molecular scale and injected into the body of a man in order to save his life. Dalí's painting of the subject seems to describe this transformation. Split into two halves with one, the facial image, shown dissolving into the figure of the patient at the left, the painting also shows the emergence of the space-suit-clad figures forming from the molecules and their injection into the man's skull. This, Dalí has also mysteriously adorned with a sequence of numbers. In addition, the patient also models another particularly Dalinean feature, an excessively elaborate and bushy moustache.